(21 June 2017) – Online learning as a tool for spreading sustainability knowhow has taken off, with tens of thousands of people signing up for courses on subjects as diverse as agroecology, reinventing democracy and ecovillage design. Two pioneers in this online field are L’Université des Colibris, the educational arm of the Colibris movement in France, and GAIA Education, the global educator for sustainability based in Scotland. In January 2016, 23,000 people subscribed to the first free online course offered by l’Université des Colibris. The ‘Designing an oasis’ MOOC (Massive Open Online Course) – one of three now offered by the university – consists of 17 modules, which include 25 educational videos, quizzes, practical tasks and case studies. It provides an opportunity for people to envisage their dream project for a fairer and more ecological world and to plan for how to get it off the ground. This year the course attracted 9500 subscribers of whom 1500 completed it, a similar completion rate to that of 2016. 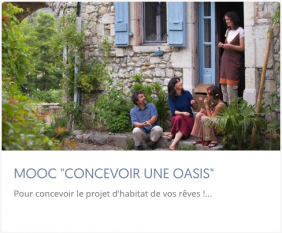 100 ecovillage projects that emerged from the course sought ongoing support from Colibris. ‘Shared governance’ in conjunction with l’Université du Nous, which aims to support societal transformation. 20,000 people are subscribed to the current course. ‘How to improve education around me’, which in September 2016 had 21,000 subscribers of which 2,700 completed it. ‘These figures, which are similar to our ‘Designing an oasis’ MOOC, confirm the level of interest for this type of free, online course,’ says Gabrielle. L’Université des Colibris also offers shorter online courses, from 1 to 6 hours long, on subjects such as agroecology, eco finance, basic income, CAP reform and reinventing democracy. Plans for future online courses include those on local currencies and permaculture. Colibris’ online courses are currently available in French only. Meanwhile Gaia Education has been providing e-learning courses around the world since 2009 and has a growing menu of courses from ‘Design for sustainability’ to ‘Renewable energies’ and ‘Big picture introduction’ offered in English, Spanish and Portuguese. To date approximately 500 people have signed up to courses, which are 1, 2 and 10 months long. ‘On average 50 percent of them complete the course within our criteria while others finish it on their own,’ says Giovanni. The online component of their educational work is equal in importance to their face-to-face courses, which are run by certified partners around the world. Giovanni’s vision is that their courses would be so-called blended programmes, a hybrid of online study and face-to-face practical experience. A more recent newcomer to online learning for sustainability is GROW, the citizen science project for building better soil. Their first free online course ‘From soil to sky’ offered participants a chance to learn how to understand soil and explore global environmental soil issues by becoming a citizen scientist.